This was a yummy, colourful meal that the whole family enjoyed this week. I pan-fried the pork chops in a little bit of olive oil and seasoned well with herbs and spices, salt and pepper. I stir-fried the red cabbage in a wok with knob of coconut oil (it gives food such a lovely and different flavour). I boiled the green beans in some salted water and then added them to a pan where I had pre-cooked some chopped onion and garlic with a little butter. I steamed the pumpkin and just seasoned with some salt and pepper. So all in all it was a very easy and colourful plate of food to prepare. 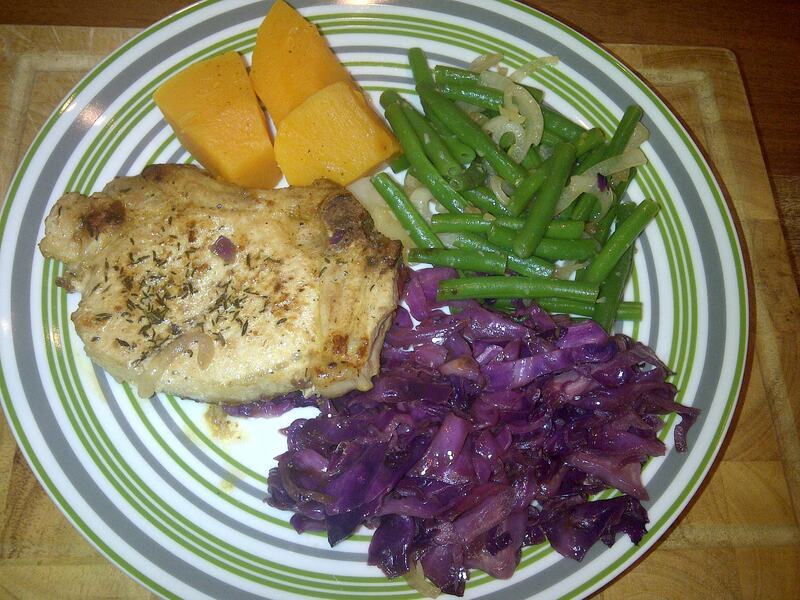 Posted on February 17, 2013, in Meal inspiration and tagged green beans, pork chops, pumpkin, red cabbage. Bookmark the permalink. Leave a comment.